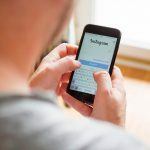 You might have heard about optimizing your website to be found on Google, but what about optimizing your Instagram profile? 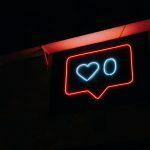 Optimizing your Instagram profile can help you be found better by your ideal audience and help you enhance your brand. 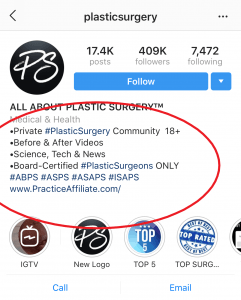 Take your plastic surgery Instagram profile to the next level with these helpful tips from Practice Affiliate. What is your current profile picture? If you’re an individual plastic surgeon, a professional headshot that people will recognize you by is a great start. If your Instagram profile is for an entire plastic surgery practice, making your profile picture your logo is a better option. Choose whichever photo that best reflects your branding. 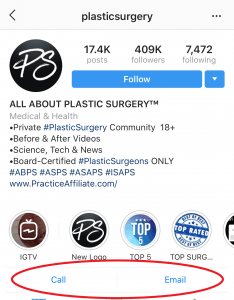 When you use the search feature on Instagram, if you type in keywords, it will show you profiles, tags, and places that pop up under those keywords. By including keywords you want to be found under in your name, this allows your profile to pop up under those keywords when someone searches them. As a result, more people can find you. 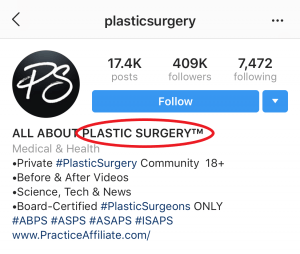 If you are a plastic surgeon, include “Plastic Surgeon” after your name. Your Instagram bio is short and simple so it’s important to take advantage of every character you can type in it. Instead of writing full sentences, list keywords that describe your account so people know what kind of content you post. For better results, use hashtags. This will also help your profile pop up more often on searches. If your goal is to gain more patients, drive traffic to your blog, or schedule consultations, make sure that you include a call to action on your bio. For best results, make this the last line of your bio. Don’t write all of your bio out in one long sentence. Break the content up using line breaks, bullet points, emojis or custom fonts to make it easier to read like a list. If you have your phone number, website, email or any other contact information in your bio, take this out. Instagram business profiles already include buttons for this below your bio. Use your bio to your advantage and remove redundant information. Replace this with relevant keywords and content. 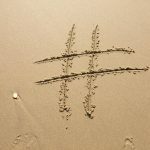 Now that your profile is optimized, you can learn a bit more about planning amazing content, using hashtags correctly and other tips from Practice Affiliate. If you would like to learn more about Instagram advertising or Instagram best practices, contact us today.